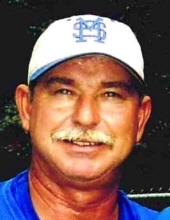 MANNING – Stephen Tucker “Coach Steve” Belangia, 61, husband of Kim Britton Belangia, died Sunday, February 10, 2019, at his home. Born November 20, 1957, in Concord, North Carolina, he was a son of Isabel Tucker Belangia and the late James Charles Belangia. He loved coaching and teaching kids, was an avid hunter and fisherman, and he attended Bethlehem United Methodist Church. He is survived by his wife and mother of Manning; a daughter, Jessica Belangia (Buddy Jacobs) of Manning; two stepdaughters, Whitney Gibbons Tabor (Lee) of Florence and Natalie Gibbons Lamb (Kevin) of Kingstree; a stepson, Nicholas Gibbons of Manning; five grandchildren, Eden, Tucker, Payton, Olivia and Jackson; and a brother, Ken Belangia of Manning. In addition to his father, he was preceded in death by a son, Stephen Tucker Belangia, Jr.; and a sister, June Belangia Rowe. A funeral service will be held at 2 p.m. on Wednesday, February 13, 2019, in the chapel of Stephens Funeral Home with the Rev. Mike Lowder and the Rev. Katherine Crimm officiating. Burial will follow at Oak Grove Cemetery. Pallbearers will be G.G. Cutter, Al Nelson, Jeff Callen, Zane Callen, King Cutter, Chris Price, Mike Windham and Will Furse. Honorary pallbearers will be his former players. Visitation will be held from 5 to 7 p.m. on Tuesday, February 12, 2019, at Stephens Funeral Home and other times at the residence, 1087 Copperhead Road, Manning. Memorials may be made to the Shriners Hospitals for Children, Office of Development, 950 Faris Road, Greenville, SC 29605-4277. To send flowers or a remembrance gift to the family of Stephen Tucker Belangia, please visit our Tribute Store. "Email Address" would like to share the life celebration of Stephen Tucker Belangia. Click on the "link" to go to share a favorite memory or leave a condolence message for the family.